Our Volunteers Strike a Blow From the Rear! This report has been wired in from Edmonville by our corespondent with Major General Douglas' Column of the Origawn Field Force. 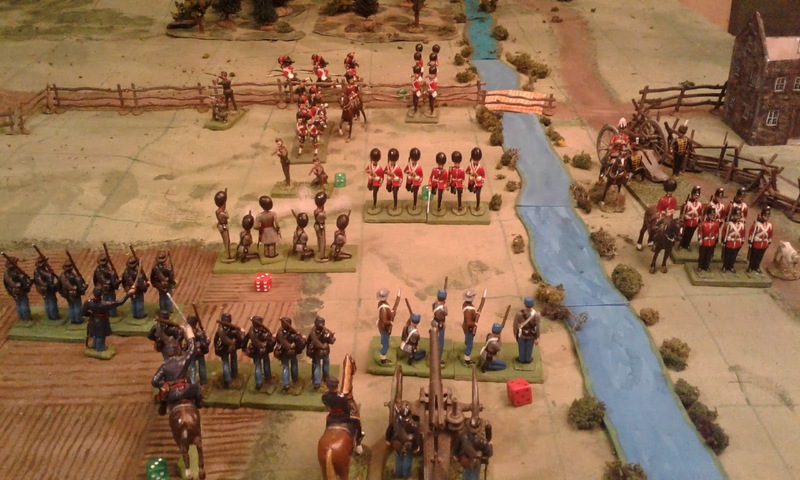 An overview of the battlefield as the Reb's flank is turned by MacDuff's column. The first battle to crush this rebellion in Origawn has been fought! On Sunday night General Douglas announced that the Queen's Volunteers would finally have a taste of battle, the army would attack the enemy on Monday. The Veteran Colonel MacDuff was to lead a column consisting of his Mount Royal Highlanders and the Victoria Rifles to march before dawn to cross upstream of the enemy's position on Bull Creek. "The Rebels will be so surprised that the battle will only last One Hour" he announced. 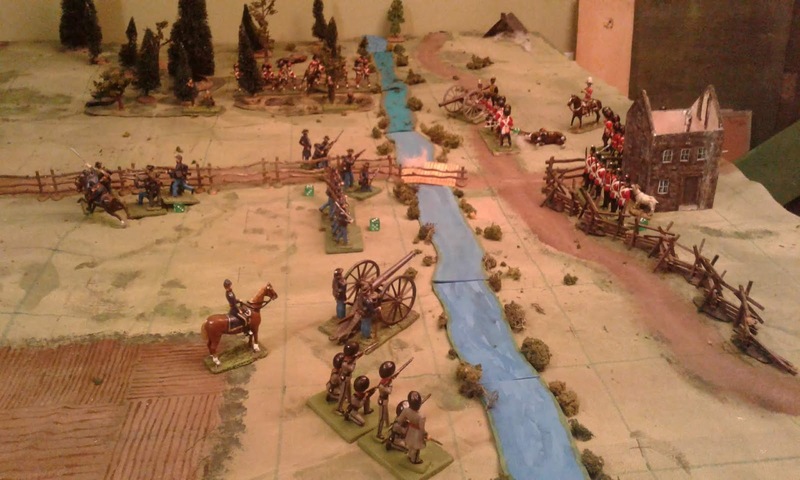 Fierce fighting rage as the Reb cavalry is repulsed by the brave Highlanders. 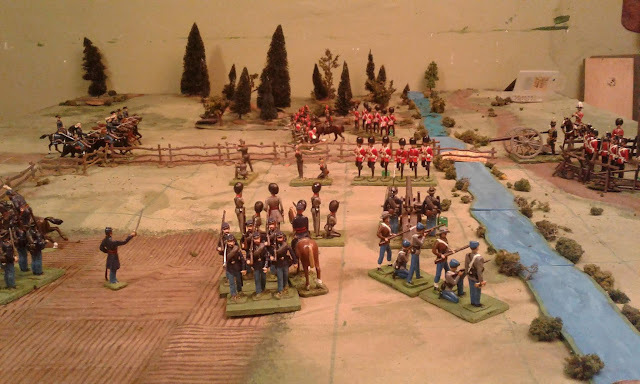 Seemingly unable to respond in kind to the General's brilliant manoeuvres, the Rebels, under the command of the newly promoted General Lannigan. just stood their ground and fired as fast as they could. The Queen's Volunteers press forward as the sun sinks. Despite several ineffective charges by the Blue cavalry, Blue seemed unable to stem the Red tide. They slowly retreated farther and farther downstream but never ceased their fierce fusillade and it was obvious that while they had surrendered the bridge, they had little notion of abandoning their grip on the Ford as well. As the sun sank low, the stream of casualties grew larger and the supplies of ammunition grew smaller. 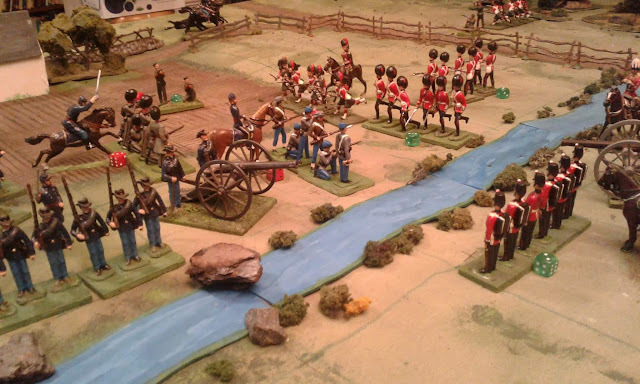 General Douglas issued orders to cease all attacks and fall back to the south bank of the Creek. As the army fell back he saluted the tired companies as they passed. "Well done my brave Volunteers! We have given the Rebels a lesson they will not soon forget". This correspondent hopes that the lesson they learned is not that they stood toe to toe with the redcoats and at the end of the day they still held their ground. Yet another inspiring battle report! The new figures look great, and fit in so well with your existing collection. I'm looking forward to seeing how the campaign evolves. Most enjoyable battle report. Excellent photos by the war correspondent and the figures are just right. I think I'm hooked again! Excellent write up which was most enjoyable to read. Ross, a question- have you ever extended the Square Brigadier beyond ww1 into the interwar period? Do you think it would work? In my minds eye l have a set up which retains a toy soldier look with gridded board but set in the 1920/30s. I am considering using old hollow casts . I can’t make up my mind if I am on to something or if it is a dead end. Any thoughts welcome. I did do a generic modern version several years ago. (4?, 5?) and have occasionally thought about mid-war but decided I was over reaching myself, too many periods! My boys did well in their first action. We were awaiting reinforcement from the artillery train which apparently lost its way. A most interesting account of this lively action at Bull Creek. More fine reporting from the Newport Noodle! The Grey Grenadiers look great in action. I see the Fort Henry Guards brought their mascot into combat with them. Hopefully he will not fall into the enemy's hands; heathens like them do like barbecue! I dunno, he's a pretty tough old goat after 50+ years of campaigning. Never Mind said the Duke.